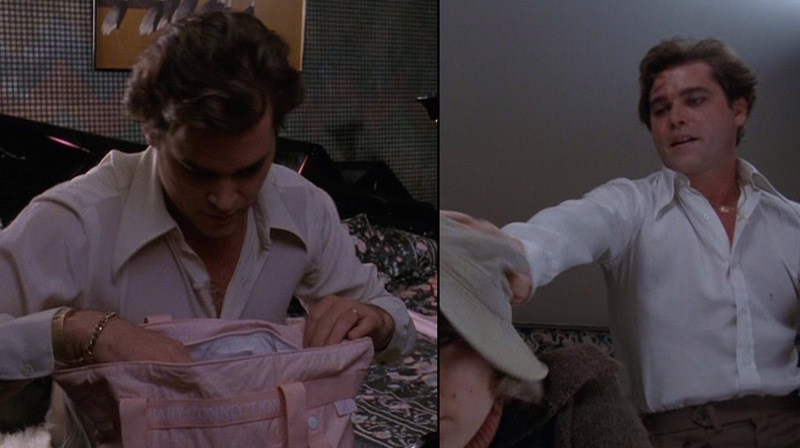 Today’s Mafia Monday post examines a brief – but brilliantly-scored – sequence in Goodfellas detailing the newly-paroled Henry Hill’s regression into criminality, now exacerbated with drug deals in Pittsburgh (hey, that’s my hometown!) Of course, not only is Henry’s interstate cocaine commerce illegal for many reasons, but it’s also verboten in his branch of the Lucchese family as dictated by capo Paulie. Henry’s new drug trade means a few new women in his life, too. In addition to his wife Karen (Lorraine Bracco), the Hills have enlisted the help of an idiosyncratic courier named Lois Byrd (Welker White) who complains about Pittsburgh (HREY!) and refuses to travel without her lucky hat. Henry’s also got a new goomar, Sandy (played by Debi Mazar and based on his real-life girlfriend Robin Cooperman), whose irresponsibility makes her a poor partner for the tricky business of cocaine trafficking. The sequence is set to The Rolling Stones’ “Monkey Man”, a brilliant deep cut from their masterful 1969 album Let It Bleed that also featured during the movie’s iconic “helicopter sequence” toward the end. Never released as a single, “Monkey Man” enjoyed a resurgence in popularity thanks to its use in Goodfellas and the Stones themselves incorporated it into their Voodoo Lounge and Live Licks tours in the ’90s and 2000s. The song was also prominently used in an episode of HBO’s Entourage, which also starred Debi Mazar in a supporting role. Henry rocks some great vintage leather while out and about in Queens, sporting a brown hip-length jacket with styling that would’ve been very fashionable in the late ’70s. The front placket has four brown plastic buttons that button up to the long, shirt-style collar. The waist is pulled-in for a more athletic silhouette. On each front side below the waist is a hand “mechanic’s pocket” with a slanted opening. The breast pocket closes with a straight zipper. The sleeves are set-in and each end in a pointed tab that Henry leaves unfastened over his wrists. 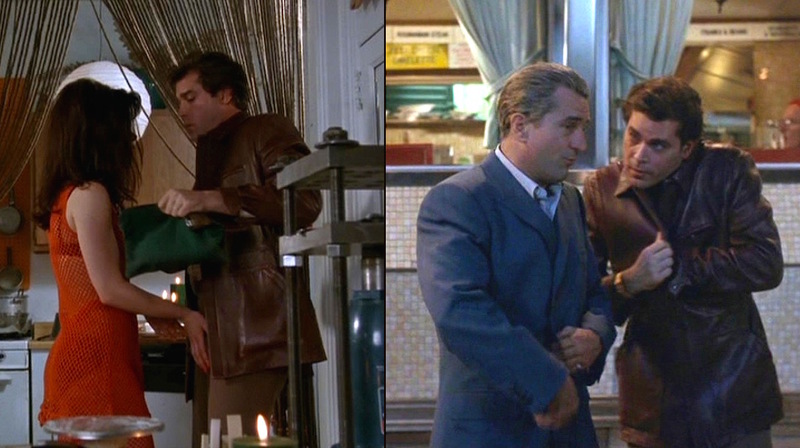 Henry also wore the jacket in a brief scene after the fallout of the Lufthansa heist when leaving a diner with Jimmy Conway (Robert De Niro). Jimmy goes over to harass some sleeping FBI agents, giving Henry a great opportunity to showcase The Liotta Laugh. Henry’s silky white disco shirt would have been quite fashionable in 1978 with its excessively long point collar, worn wide open with the top two buttons unfastened down the placket. His initials “HH” are monogrammed in dark threading on the left breast. The shirt bunches up at the cuffs, fastened tightly with a single button around each wrist. Men’s fashion in the ’70s followed a somewhat hourglass-inspired structure – not to be confused with hourglass body figures – with width emphasized at the top (shirt collars) and bottom (flared legs), pulled in tight and slim through the torso and mid-section. We clearly see this with that large-collared shirt; his brown flat front trousers also follow this pattern, tight over the hips and then flaring out from the knee to the plain-hemmed bottoms. The trousers fasten around the waist with two 2-button tab adjusters on each side toward the back. The front has a pointed tab that extends over the right side of the fly and through a single belt loop to fasten with a single button. There is a straight pocket on each side seam and a small pointed flap that buttons down over a coin pocket on the right side, just below the waistband button. Henry surprisingly opts for black leather footwear despite the brown leather jacket. He appears to be wearing black socks with his black split-toe bluchers. Around his neck, Henry wears a gold necklace chain with two pendants symbolizing his faith: a Catholic cross for his birth family and a Star of David for his conversion to Judaism after marrying Karen. Including this necklace, all of Henry’s jewelry is yellow gold. Karen, Lois, and Henry react to Lois’ borrowed baby with different degrees of enthusiasm. Henry’s other symbolic jewelry is the plain yellow gold wedding band worn on the third finger of his left hand. 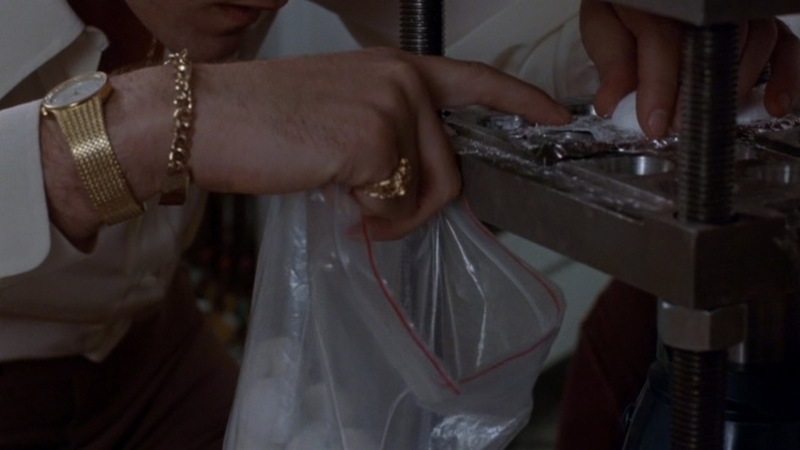 The rest of his jewelry is clustered on and around his right hand, including a gold pinky ring with a set-in diamond. Want to show Henry Hill that you don’t care about him? Buy him silver jewelry. On his right wrist, Henry wears a slim yellow gold wristwatch with a round white dial and diamond-crusted bezel. Closer to the hand, Henry wears a yellow gold chain-link ID bracelet. Henry dresses fashionably to be a man around town in the late ’70s with brown leather and plenty of gold jewelry to boot.